An AmazonFresh truck arrives at a warehouse in Inglewood, California, to pick up deliveries for Los Angeles, which got the service in 2013. Amazon (AMZN) is bringing its AmazonFresh grocery delivery service to Brooklyn Friday, marking its East Coast debut. Customers can order groceries and other stuff like toiletries and electronics. Orders for more than $35 that come in before 10 a.m. will be delivered the same day, with later orders arriving the next day. Only residents of Brooklyn's tony Park Slope neighborhood — specifically the 11215 ZIP code — will be able to order groceries with the service at first. But a company spokesman said other Brooklyn neighborhoods will get access in the near future, but declined to comment about moving into other New York City boroughs. It's free until the end of the year, when Amazon will begin charging $299 annually for the service. Amazon will be competing with a number of other grocery delivery services available in the New York area, from local grocery stores to FreshDirect, which is available city-wide and in a few nearby states. 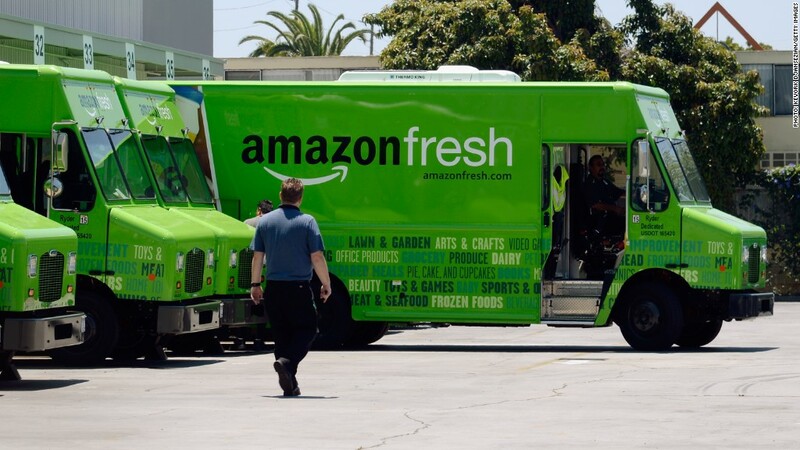 AmazonFresh launched last year, and is already available in the San Francisco Bay Area, San Diego, Los Angeles, Orange County, California, and Amazon's hometown of Seattle.